Search Call to Conversation Snapshots by topic, date or location. 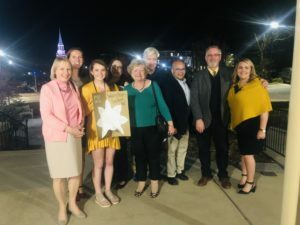 A group of Wake Foresters gathered over dinner in Alumni Hall on the Reynolda Campus on April 3, 2019 to discuss Leadership & Character. Many of us shared stories of family members who have served as strong examples of character–parents interacting & connecting with those in our community who are different from us; grandfathers displaying incredible humility amidst great success and giving their blood (quite literally), sweat, and tears to help others; and a mother showing great love and focusing on others even through her own trials. We raised a few questions: How do you export character? Should we? Is character relative and unique to our own experiences? Is it accurate to talk about character as though it is synonymous with morals and values? Through our conversation, we came to some great conclusions: that change is incremental and an individual or personal relationship often influences character the most. We began our conversation sharing times we had seen character in action. Many of our experiences included examples of authenticity, patience, and compassion for one’s neighbors. Our discussion then turned to whether or not character can be taught. We agreed that character can be taught but not necessarily in the classroom setting. Instead character is learned by persevering through difficult situations, such as death and suffering. The theme of death carried over to a discussion on eulogy virtues and how we can focus on these instead of “resume” virtues. We discussed character in action through our own lived experience. Some of us used specific people and events for our examples, others used broader examples of character revelation over the lifetime of a particular person or a series of events. Character is revealed through servant leaders; in its truest sense, character is exhibited when no one is looking; character has taken a back seat in our culture; and now, especially, we need good role models of character. 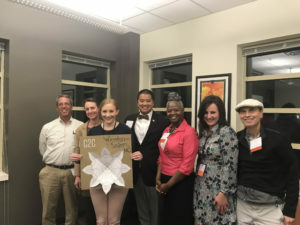 We talked about the campus community and asked ourselves, “How do teachers become positive role models” when “WFU can be a bubble”? 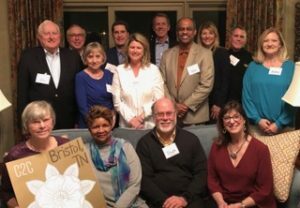 A group of Wake Foresters gathered over dinner in Bristol, TN on April 2, 2019 to discuss Leadership & Character. We never know how what we do today will influence others. It is our responsibility to cultivate the good in others. Acknowledging others’ positive character traits reinforces positive behavior. Character is often evidenced in: the “little things”; individual resilience; putting others first; and doing for others without desiring or expecting notoriety. Each of those we spoke about were genuine, intentional in how they reached out to us, and present in our lives. We acknowledged that as they lived, so should we. We concurred that no matter our differences – politically or otherwise – we should begin discussions on the premise that we all have the same desire for civility and respect. Then, from this common ground, strive to find the middle ground. Some of us are still pondering David Brooks’ op-ed that shared about the differences between our “resumé” virtues and our “eulogy” virtues. This, we recognized, is the great irony of our culture today in defining success. One among us beautifully encapsulated their takeaway of the evening: that it’s so important to be intentional about developing our “eulogy” virtues. 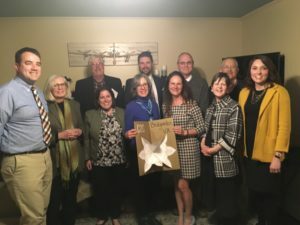 A group of Wake Foresters gathered over dinner in Bridgewater, VA on April 2, 2019 to discuss Wellbeing. We discussed how we can help the next generation in living lives of wellbeing, including understanding that social media can be a detriment to this (the perfection you see online is not the reality), helping them understand that everyone is broken by sharing our own experiences of failure or imperfection, and helping teach resiliency. And finally, we discussed the insight that in many cases, a focus on wellbeing is for the privileged – that many people have to worry about basic daily needs and survival. Self care often takes time and money that many do not have.